Forget the rowdy session in the National Assembly today, here is the breakdown of the proposed N8.83 trillion ($25 billion or $29 billion depending on your choice of exchange rate) Nigeria national budget for 2019. President Muhammadu Buhari proposed a budget of N8.83 trillion for 2019. A real GDP growth of 3.01% and inflation rate of 9.98%t were assumed. 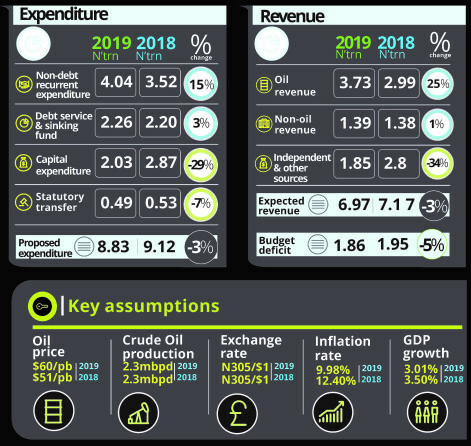 Deloitte Summary: The 2019 Budget which flows from the 2019-2021 Medium-Term Expenditure Framework (MTEF) showed projected aggregate expenditure of N8.83 trillion, expected revenue of N6.97 trillion and a deficit of N1.86 trillion. The planned expenditure for 2019 is lower than the approved 2018 Appropriation Act figure of N9.12 trillion by 3% but higher than the estimate of N8.6 trillion contained in the President’s initial submission to the National Assembly. The expected revenue of N6.97 trillion for 2019 is also lower than the approved 2018 budget of N7.17 trillion by 3% but higher than N6.6 trillion contained in the Appropriation Bill initially submitted by the President.